Our 2017 Road Trip, Part 43: No, Welcome to OUR World of Toys « Midlife Crisis Crossover! Across the Ohio River and the Ohio/West Virginia state border, a couple miles west of the Kruger Street Toy & Train Museum, a 1913 vintage building was formerly known as Gravel Hill Middle School, or simply Gravel Hill School in some sources I located, until it was closed in 2001. 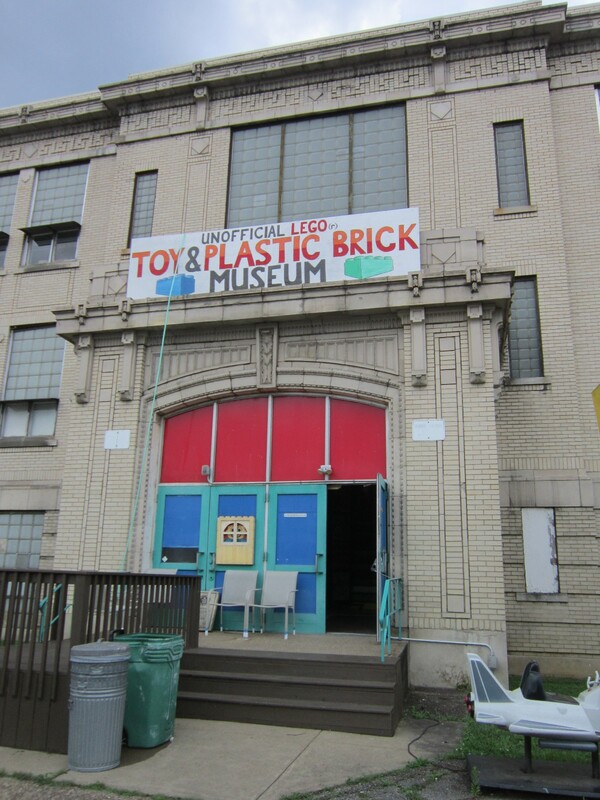 After a period of dormancy, in 2007 it was reborn as the Toy and Plastic Brick Museum. The LEGO name was originally in the masthead until the company objected and denied them permission. 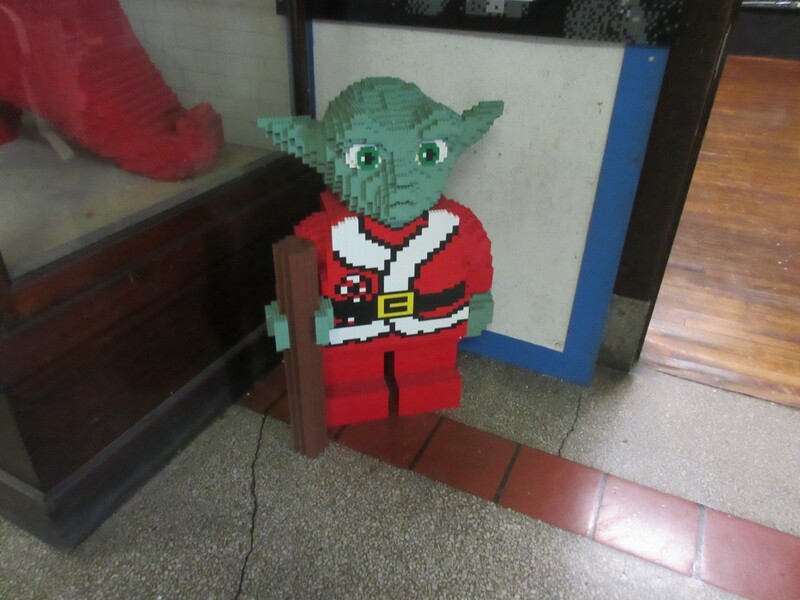 This unofficial Lego showcase — only open from May to August each year — is in the village of Bellaire, whose 2010 census stats and overall outward appearance indicate times have been tough around this part of the American heartland for a very long time. Our lunch options later were few, and our cell phone signals were weak to nonexistent. If you can navigate the town’s maze of one-way streets, the museum has a large lot out front where you can leave your car wherever. 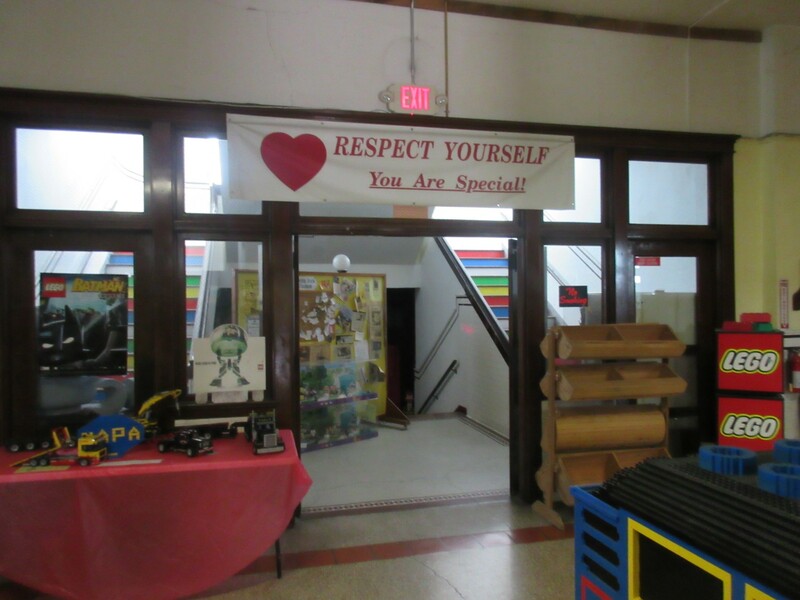 Much of the former schoolhouse is closed off, with the museum comprising one main hallway connecting several rooms of varying theme and decor, or lack thereof. 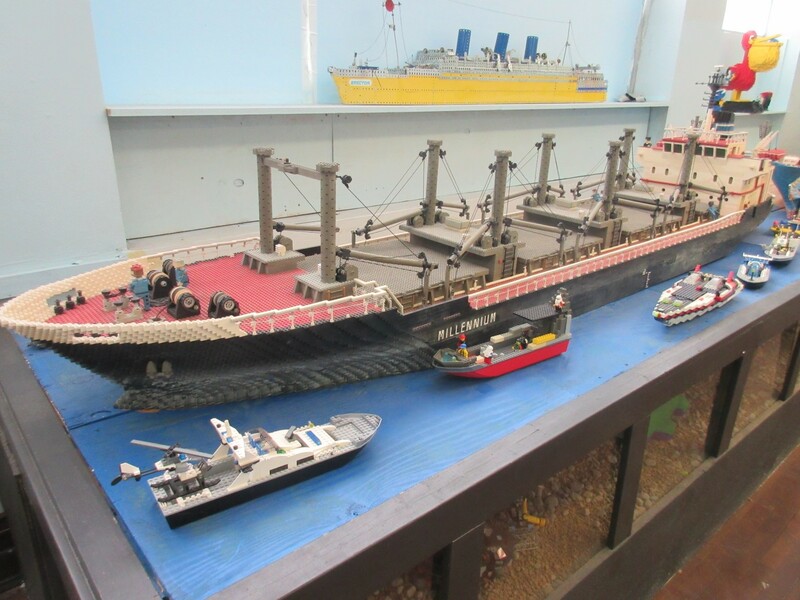 Legos are their primary focus, with exhibits a-plenty either acquired from retailers that no longer needed them, built by their own in-house crew, or created from scratch by a particular artist from Alaska. As one would expect in this day and age, the wondrous world of Star Wars popped out of nooks and crannies all over. 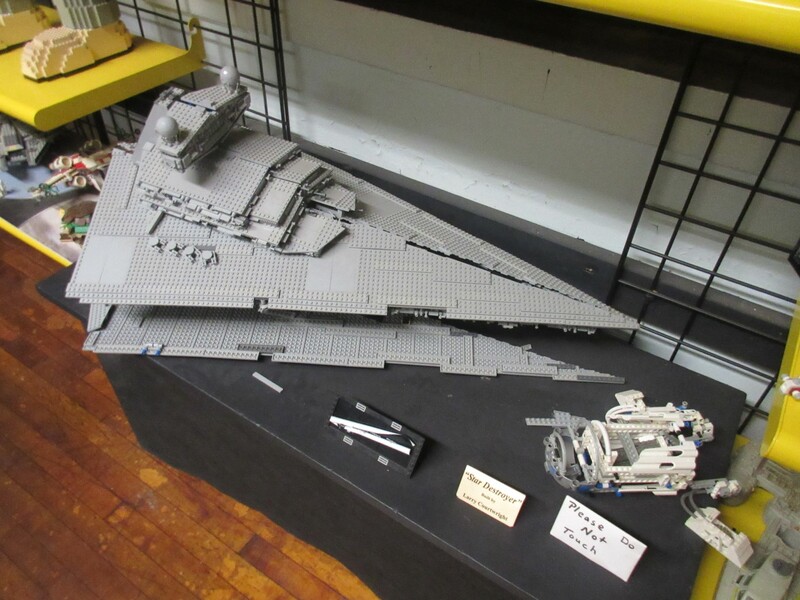 Lego Star Destroyer, as I recall one of the most expensive sets once available in stores. Lego TIE Fighters if you’d rather start smaller. 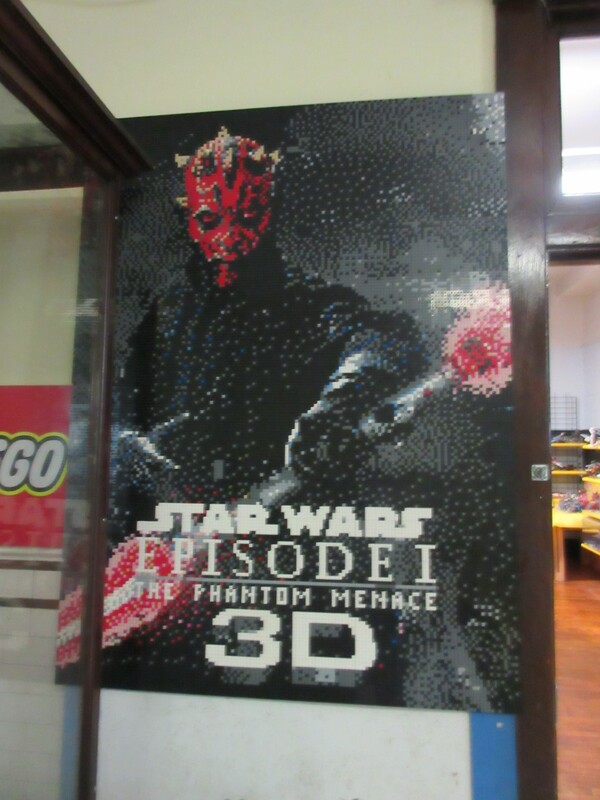 Lego Phantom Menace movie poster, reminding us of slightly simpler times in the fandom. 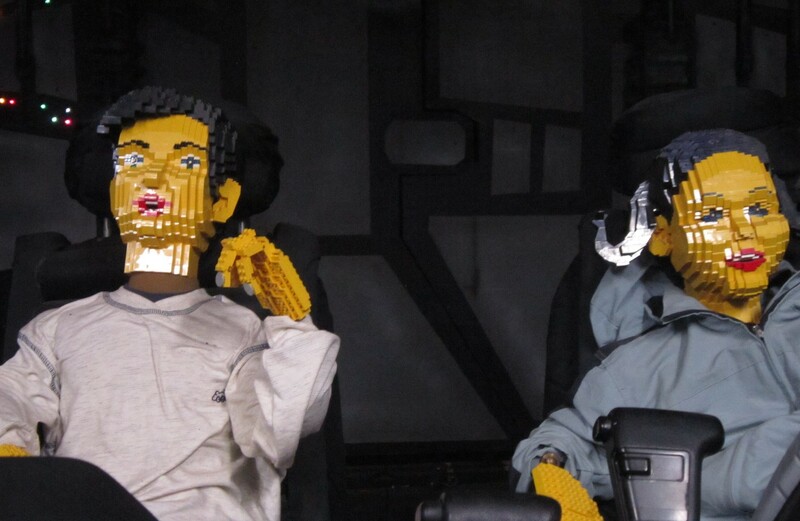 Lego Han and Lego Leia. Too soon? 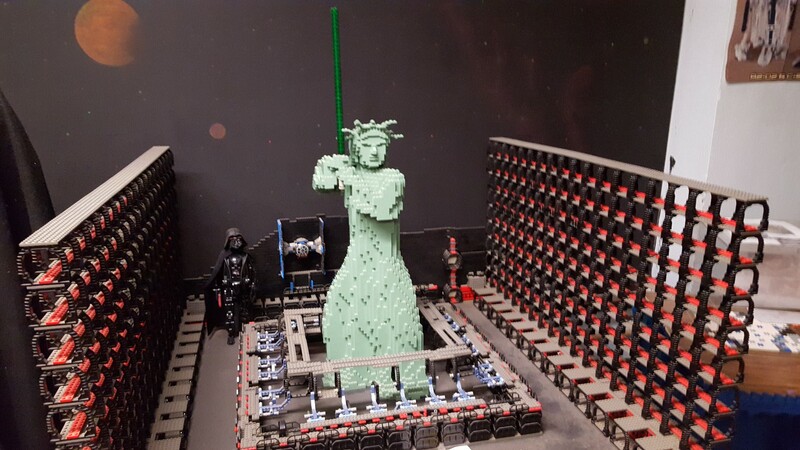 Lego Jedi Statue of Liberty. Because why not. Whereas their rivals over on Kruger Street have had nearly two decades for furnishing, renovating, and generally overhauling their headquarters, the T&PB Museum showed numerous signs of its former life here and there and everywhere, evincing a vibe of the children who once walked its halls, grew up here, learned everything they knew here before graduating to the community’s workforce and later seeing their alma mater fade away. 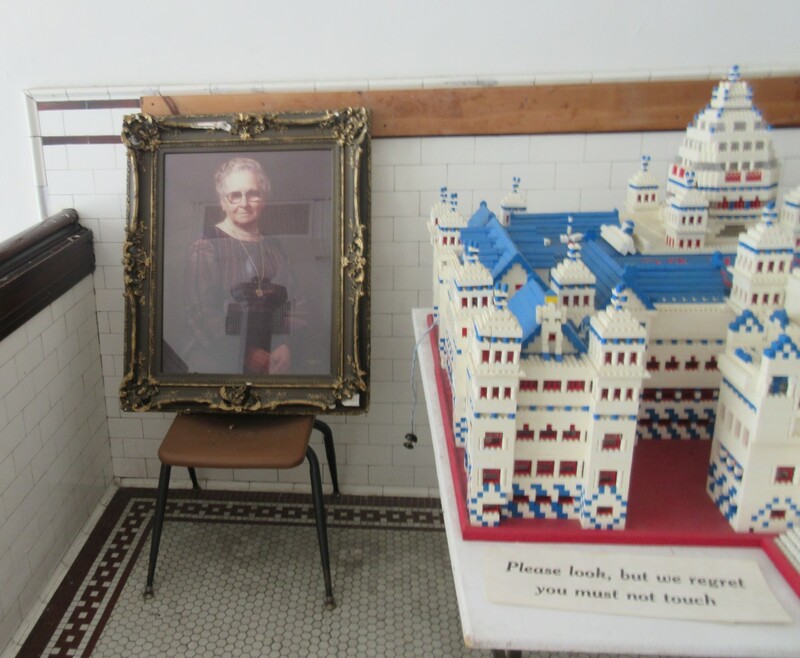 In noticing these ephemera and the unretouched surfaces and bygone tiles and such, I was reminded of a phrase we picked up when we visited Eastern State Penitentiary in Philadelphia on our 2010 road trip: the sum of the school parts represents a sort of “stabilized ruin”. 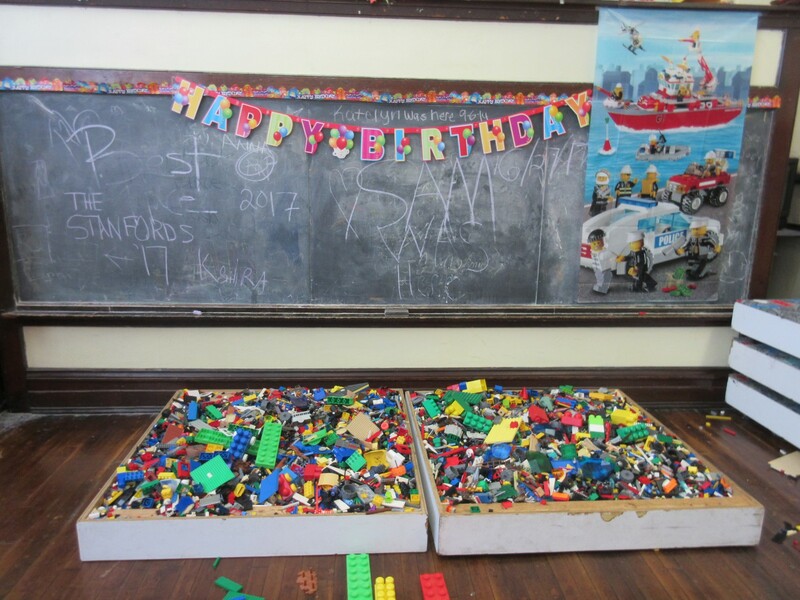 Lego pits in front of a literally old-school chalkboard. 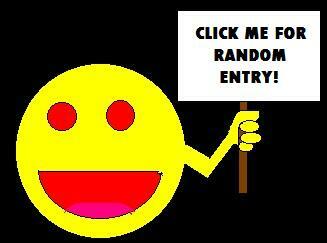 Inspirational banner refuses to give up the fight for self-worth. 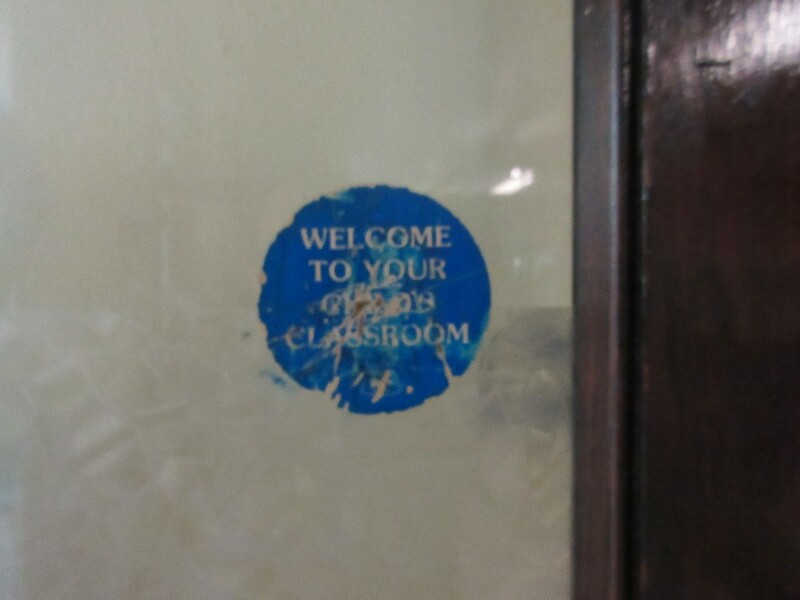 “Welcome to Your Child’s Classroom” says sticker that probably annoyed the heck out of those who’ve tried to peel it off over the decades. A leftover billboard has seen some use over the past decade, but wants for updates. 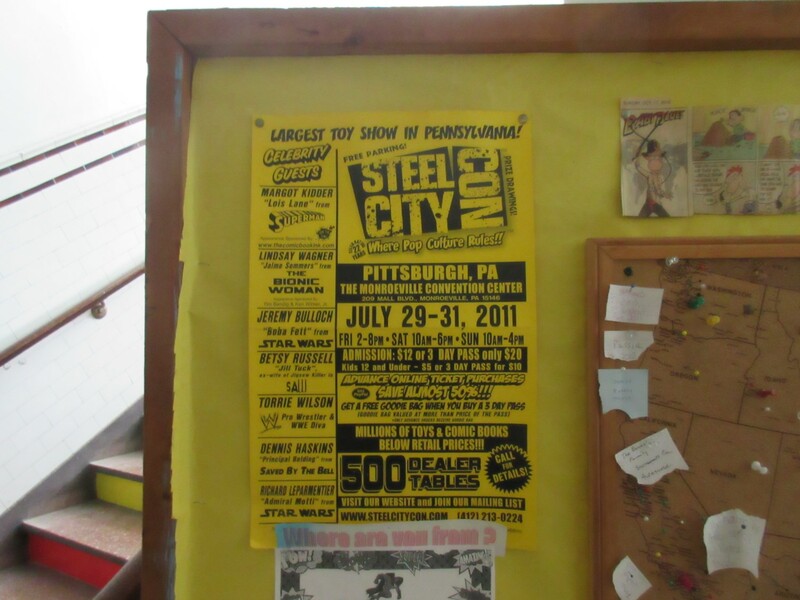 Fellow convention fans can check out the guest list for Steel City Comic Con 2011, assuming they didn’t all later cancel. The Kruger Street Museum had its site history of an alleged Indian burial mound. The T&PB has the picture of Grandma Gray. Observant guests may notice a side passage off the front door that leads down to the basement, which was once the school gymnasium. Lining the halls are a series of castoff exhibits and accompanying placards from other, more accredited museums where curation and contextualization were a thing. The big, big showpiece is a stage setup with a Lego robot band who once graced the dance floor at an FAO Schwartz. 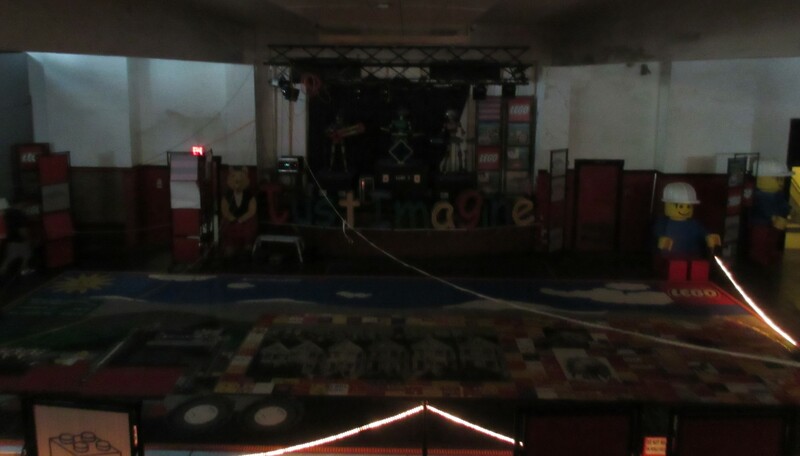 A few minutes of fumbling around led me to the controls, which turned on the lights, activated the band, and shook the entire room with a volume-9 rendition of a Lego theme called “Just Imagine”. We were so surprised by their activation and jackhammered by the sound system that we failed to get decent pics with the lights on. Another, better tourist took video of their performance years ago. 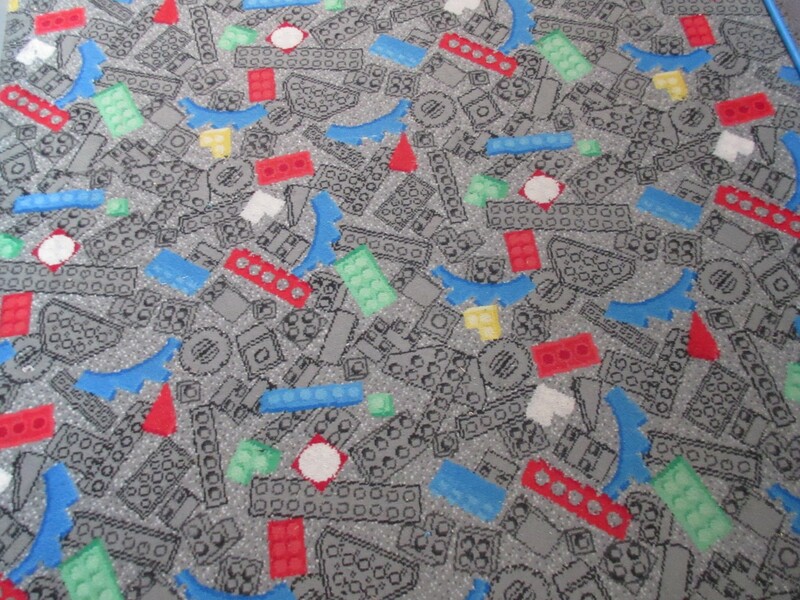 If you have sensitive feet that might hate the hardwood floors of the upper story, the basement halls are lined with Lego carpet. 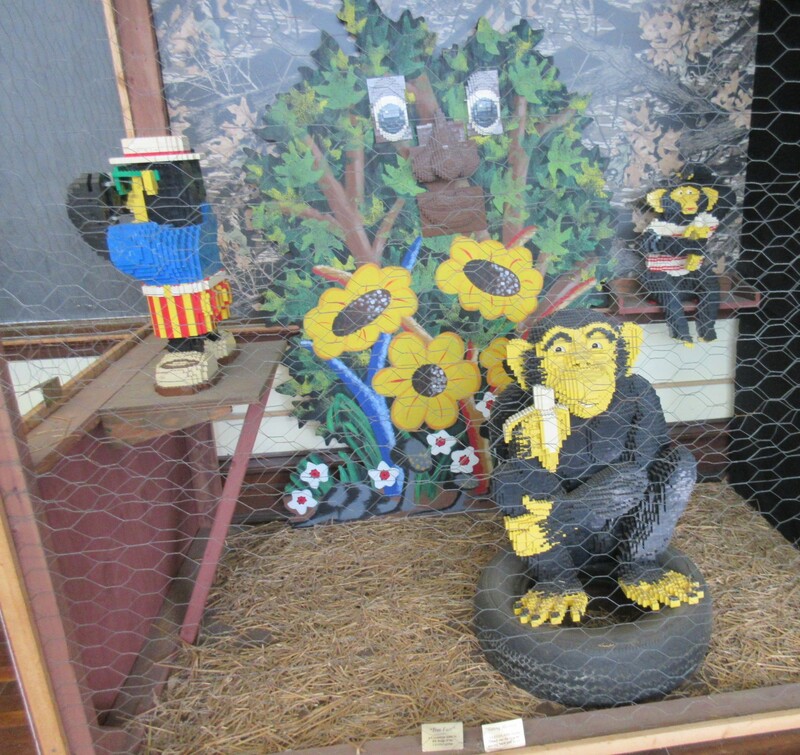 To be honest, we didn’t take too many pics of their non-Lego displays. Very few items were labeled, most within reach and probably played with rather often. 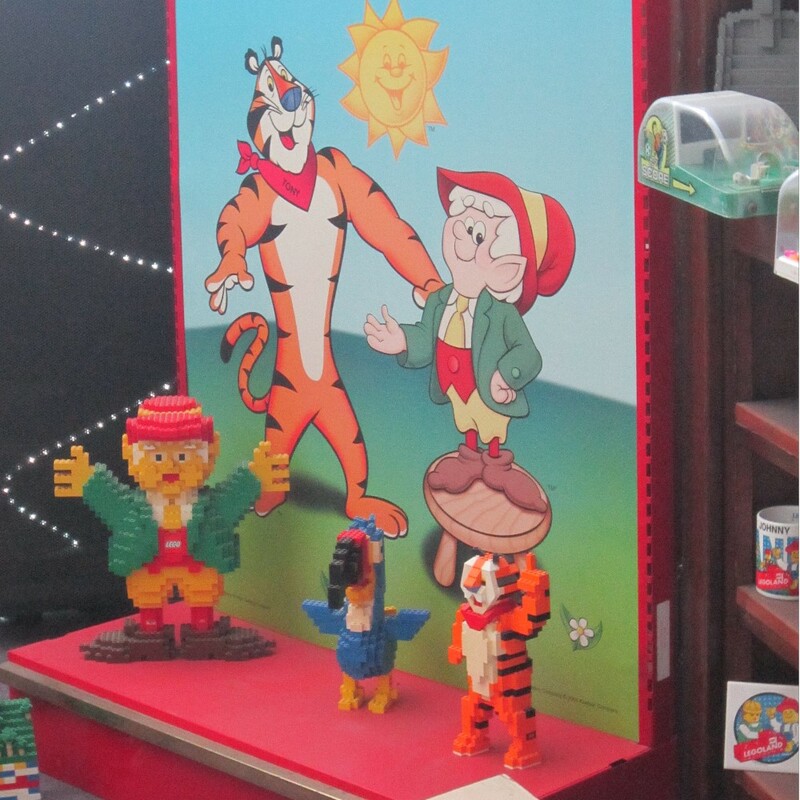 The gift shop and admission register are in a corner room, leaving most of the grounds on the honor system, like a large thrift store but with only one employee on duty. 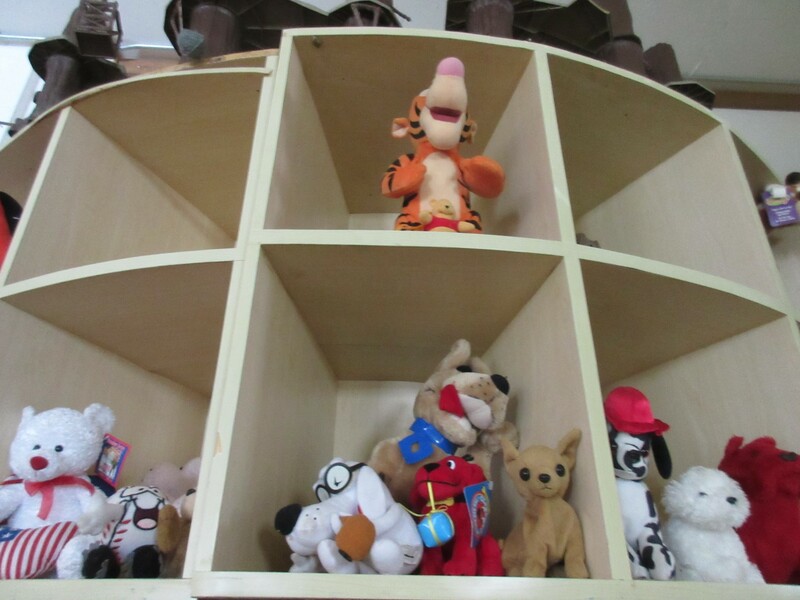 Stuffed animal gangs now infest cubbyholes that students once used for their stuff. 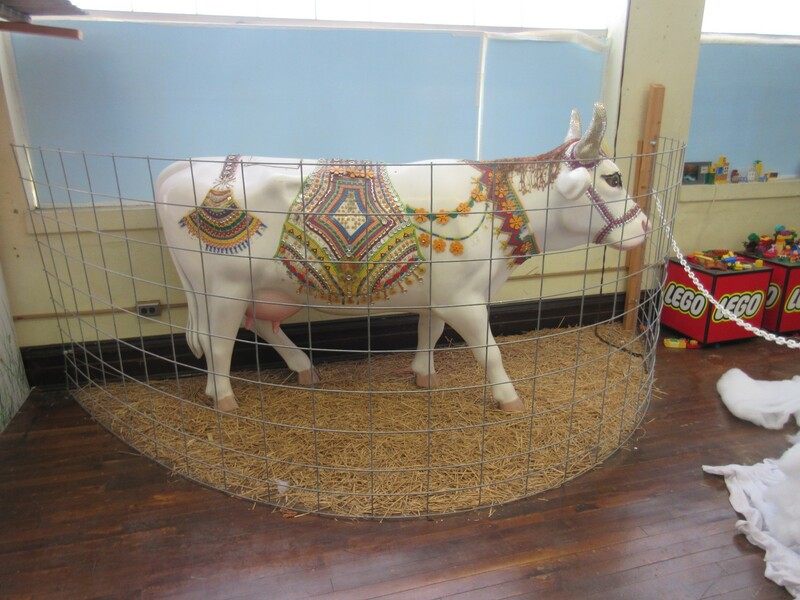 Sacred Indian cow. I shall now stop typing and pretend this is self-explanatory. 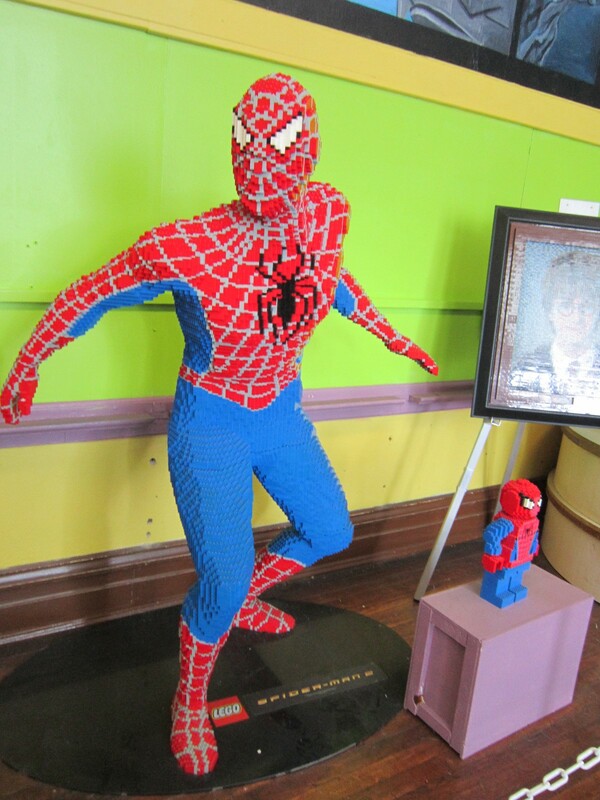 Likewise, the quality and interest level of the Lego sculptures varies wildly depending on your interests. Some of them represented unrecognizable quantities; others captured the look of favorite pop culture characters. Whatever the Millennium is, here it is in Lego microcosm. 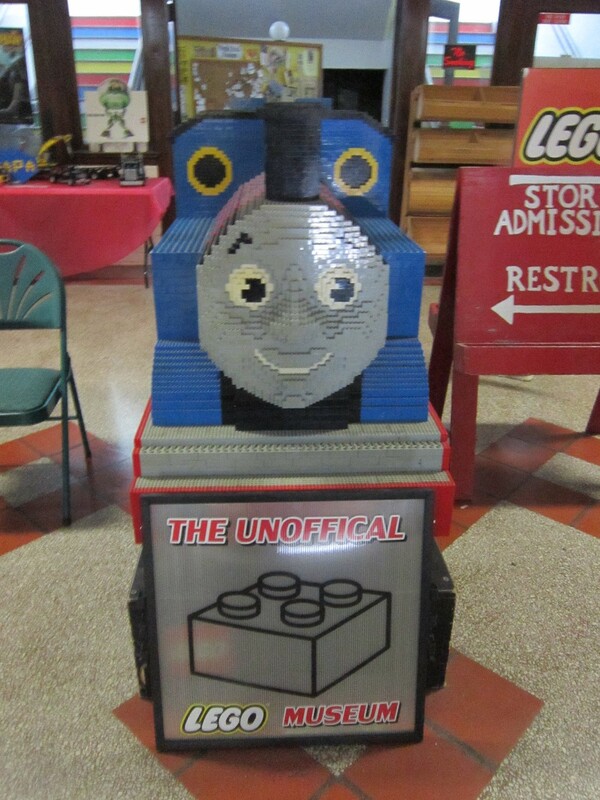 Lego Thomas the Tank Engine, with echoes of Kruger Street. Lego Spider-Men from the Lego Spider-Verse. 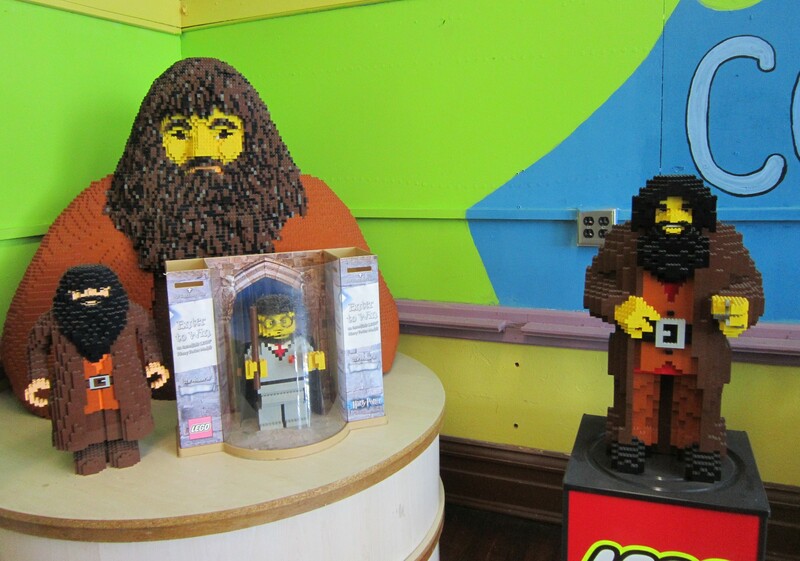 The Parliament of Lego Hagrids sits in judgment on Lego Harry Potter. 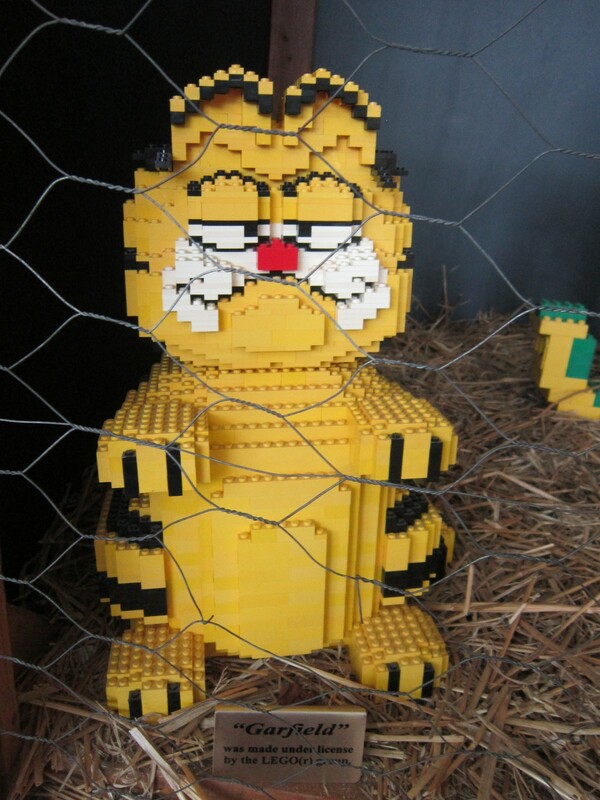 Garfield is a longtime Indiana institution, so his Lego analog may be less off-putting to us than to you. Lego breakfast mascots preaching the importance of a nutritious Lego breakfast. 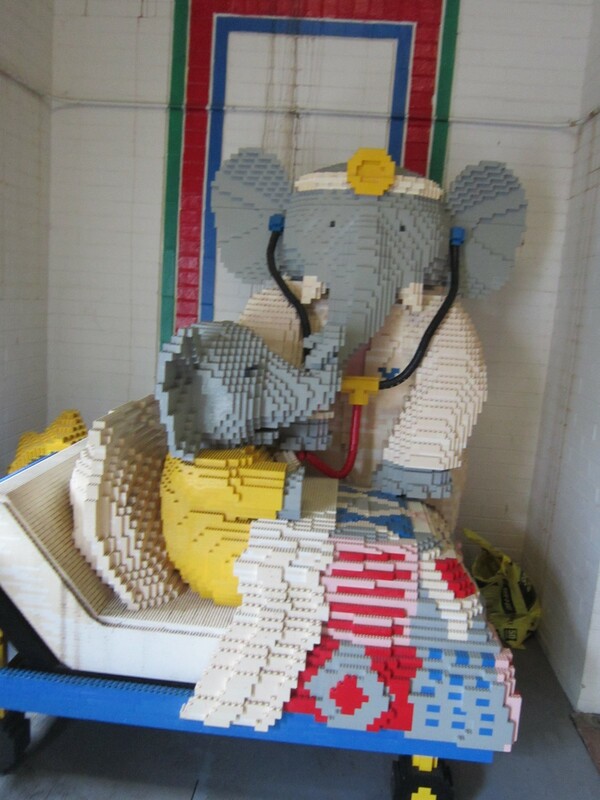 Lego Doctor Babar, for fellow olds who remember the elephant if not this particular career diversion. 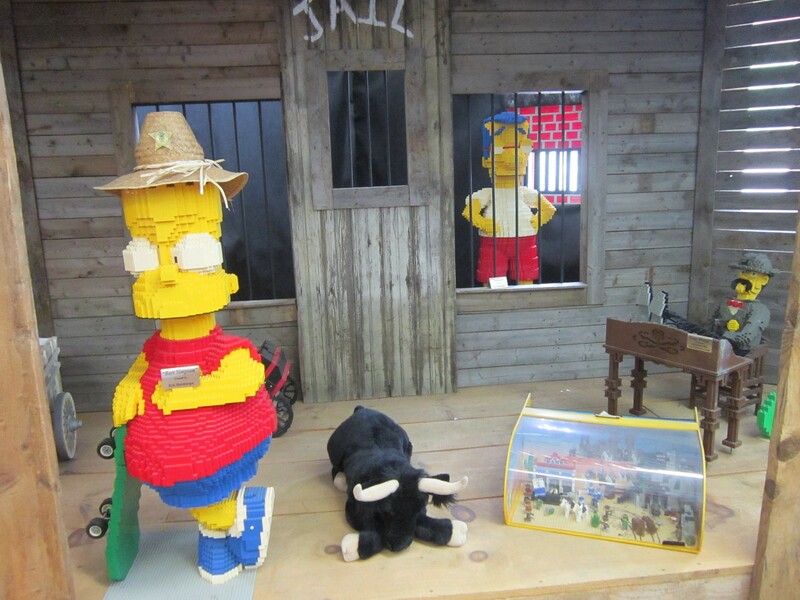 Lego Sheriff Bart Simpson guarding Lego Outlaw Milhouse. 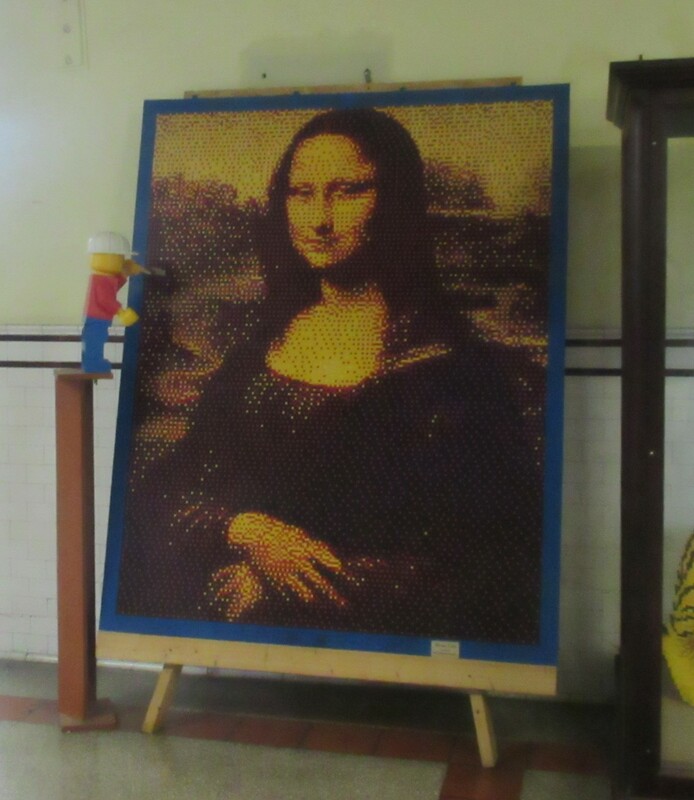 Lego Mona Lisa, for the Lego fine art aficionados out there. 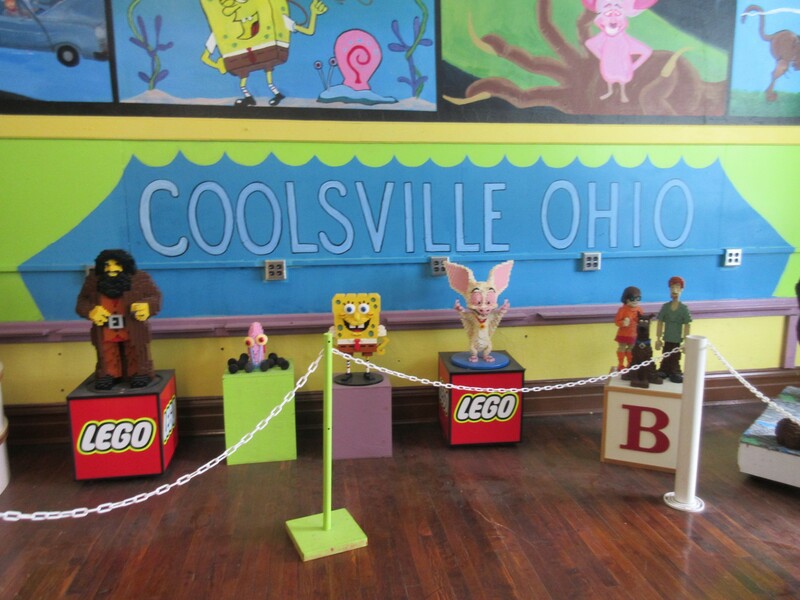 Not sure if “COOLSVILLE OHIO” is another education remnant or an attempted new upgrade. 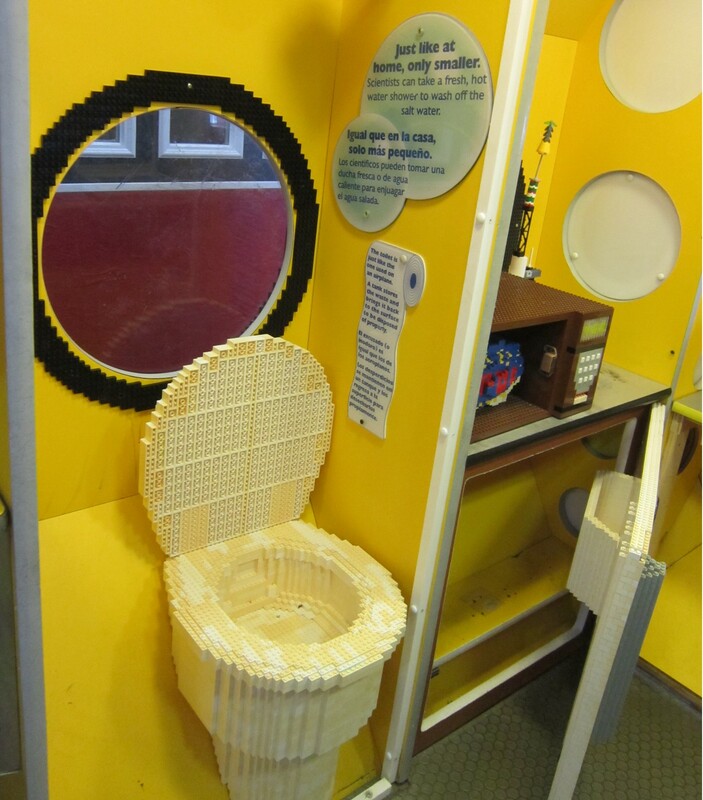 By all that is holy, please be aware the Lego toilet is merely a display item. We wandered all the rooms, spent more time in some than in others, and conducted the predictable personal survey of Hey, I Recognize That Character. 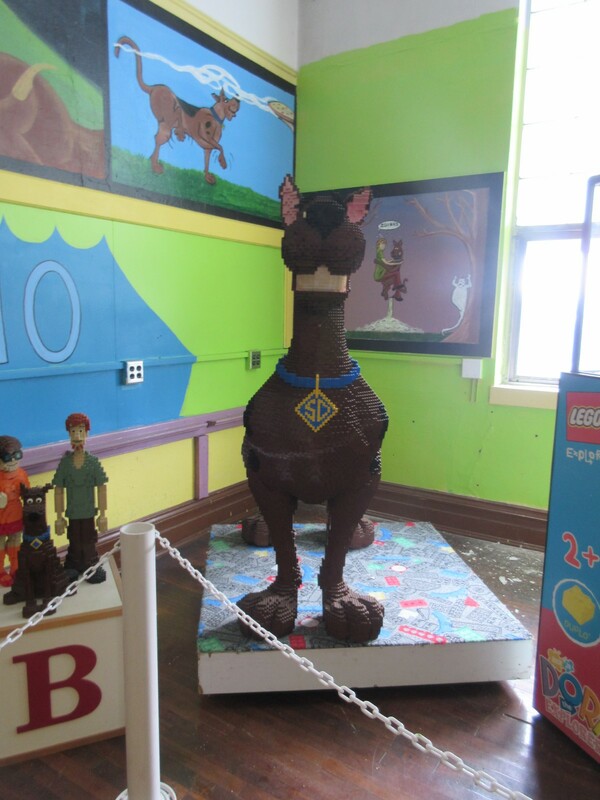 Their gift shop wasn’t our thing, but anyone who brings kids might check it out if they love Legos. And if you need to use the bathroom before returning to your road trip…I can’t help you there because I had zero interest in seeing if the school bathrooms had been as imperfectly preserved as some of the other old trimmings. My adventure level has its limits.